Mahmoud obtained his LLB in 2006 from Ain Shams University – School of Law. 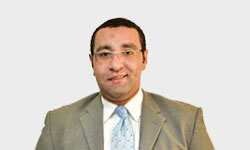 Mahmoud joined Eldib & Co in 2007 as an associate specialising in corporate law, labour law, contracts and litigation. He assists our clients by helping them incorporate companies in Egypt. He advises clients with regards to the required documents and offers them broader legal support during the set up stages. Mahmoud is also experienced especially when it comes to the procedures of setting up all types of companies and provides his clients with comprehensive legal advice. He is also responsible for drafting shareholder’s agreements and arranging general assemblies. Mahmoud is a member of the Egyptian Bar Association.